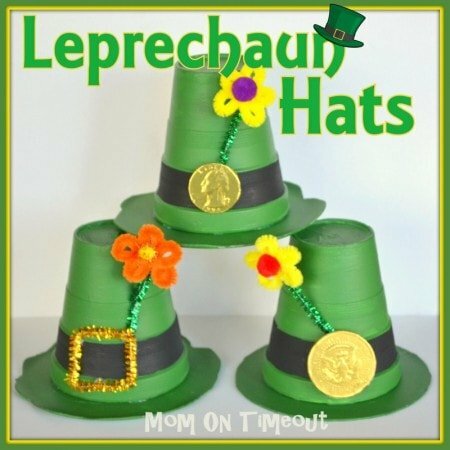 Leprechaun Hats are such a fun craft for St. Patrick’s Day! I’ll be perfectly honest. These Leprechaun Hats didn’t turn out how I had envisioned, but with Reece as the driving creative force they turned out even cuter than mine would have. We used styrofoam cups and plates to make these adorable Leprechaun Hats – perfect for St. Patrick’s Day! Cut out a circle from the plate. (I did one circle and then utilized the curve in the plate to create a little more flair in the other two.) Paint the cup and plate green. It takes several coats and is great practice for the kids. Paint a black stripe around the top of the cup. It can be as wide or narrow as you like but mine is about an inch wide. Glue the cup to the plate to make the hat. Put a thin line of glue (I used hot glue) on the bottom of the cup and adhere it to the plate. Twist the pipe cleaner to form one petal and then twist the ends. Shape another petal and then twist the ends again. Keep repeating until you have your desired number of petals – I made five. Use a small piece of green pipe cleaner for the stem. 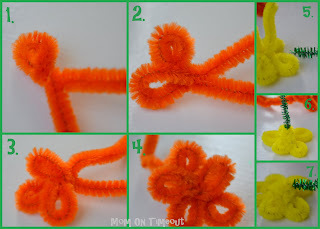 Wrap the ends of the pipe cleaner that you used for the flower around the green pipe cleaner. Pull the stem down so that it lays nicely behind the flower. I made three flowers and added a little pom pom to the center at Reece’s request. He thought it needed some more color and I agree! Glue the flowers onto the hat. Form a rectangle out of gold pipe cleaner and glue to the hat OR glue on a gold coin. They turned out so cute and were quite easy. I love how the flowers brighten these little Leprechaun Hats up! Linking up here, Home Stories A2Z, and My Repurposed Life. hey what kind of paint did you use, I tried this with tempera paint and it peeled once it was dry. Its a really cute project and wanted to use it for seniors craft. but the paint peeled when I was making my example piece. I used acrylic paint. Yeah, I don’t think tempura would work the same. Love these, might fill mine w/ goodies! These are so cute. My kids would have loved to make these when they were little. cuteness.. I pinned you too! Just wanted to let you know I featured you at http://craftymomsshare.blogspot.com/2012/03/sharing-saturday-11-st-patricks-day.html. Thank you for sharing with us!